So when you enjoy improvisation, what could be possibly out of your comfort zone? How about scripted theatre? No, better: how about scripted comedy? The idea hit a funny bone that jerked me into saying, “yes” before I knew what I was getting into. As a kid, I loved making people laugh. And I often could, resorting to stunts or plain goofiness if necessary. 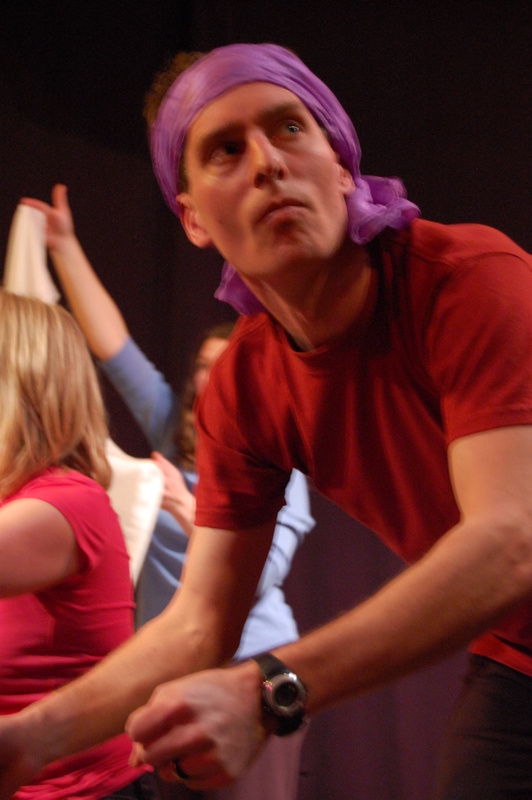 In Playback Theatre, even my kids tell me, “you’re the funniest.” But funny on script? That always seemed iffy. I used to be a solid actor on script, but the difference between getting laughs and not getting laughs seemed to be the tiniest inflections of voice or facial expression. How do comedians do it? How do they basically guarantee laughs? I had heard stories of my father and how he had been a joker in his youth. Yet I rarely saw this side of him as he worked hard to support our family of six. Now with two young children myself, I find myself similarly preoccupied and stressed, often acting out the “serious germanic father” archetype in everyday exchanges. I realize it’s both a balancing desire (or instinct) and a survival mechanism to awaken my funny gene. I seriously undertook this creative project to be funny with a “dare me” stunt to do a stand-up comedy routine at our Playback Theatre’s pre-show Open Mic. I enlisted the help of two seriously funny local improv artists, Christina Myers and Luke McCloskey, who shared in one intense tutorial everything I needed to know about being funny. Oh, and a book. The Comedy Bible, by Judy Carter. Luke had taken a course with the author and was eager to share its essence. I got really excited to be funny. I proceeded with care through this new bible’s book on doing stand-up comedy in “26 days.” The author who trained hundreds of comedians over the years, claims that her 26-step process virtually guaranteed funniness for anyone with half a funny gene, not just for stand-up acts but also for comedic writers and other comics. Along with Luke’s impassioned and humorous explanations of the basic structure of comedy, she makes a persuasive case. Unless you get to Open Mic H-hour and you’re still on Day Six, like I was. So although I didn’t finish the book or the stand up routine, here are my take-aways. Comedy has a structure. Much like story, it involves a context, an action and a twist. In this way, it’s reliable. Like improv, when the structure becomes familiar, one can flex their funny-muscles to explore the full bounds of the form. Comedy is about the unexpected. There is a set of improv games (not necessarily comedic) based on making “new choices” or using the “second thought” that comes up as dramatic material, because it’s more likely to be fresh, out of left field, interesting and well, funny. So practicing your second thought (or third) rather than taking a predictable line of talk/thought/action, can liberate your native humor. Comedy comes out of serious stuff. Even your real pain, fears, vulnerabilities. Carter’s core process recommends mining the comic’s interior, i.e., my own personal stories, to find raw spots that would invariably strike nerves in an audience. It’s the seriousness of the theme itself, along with their vulnerability, that can drive the comic’s funniness, all the more so mixed with cultural taboo and shame, even abuse and violence. Consider how many comics continue to mine the issues around racism long after it should otherwise by cliché. Or how many YouTube spoofs were made of Hitler’s final admonition scene in Der Untergang. Seriousness and funniness are energetic partners. Authentic comedic material comes from a new relationship with our own stories. Carter recommends journaling a la The Artist’s Way, to free up the stories, loosen their grip on our lives, so we can approach them with fresh perspective and especially fresh emotion. This is a compelling link with Playback Theatre, which also allows tellers (and audiences) a more ease-full relationship with their stories. As I began the stream-of-consciousness exercises, my first phases of writing were mildly amusing, then slightly bitter, then in moments, actually funny. Being funny requires other people. I appreciate more than ever now how much comedians take risks and require an interaction with audiences. Carter’s steps require a “comedy buddy” to listen to material and give honest feedback. Now that gets personal, eh? Not only would this project be hard work, but also involve looking like a fool in front of someone one-on-one before anything glorious performing stunts. For some reason, the sense of intimacy involved in sharing my personal proto-comedy felt especially scary. But I never got to this part. I ran out of time. Really. Seriously, I wanted to. Really. No, i’m serious. I have barely scratched the surface of this work. Watching Robin Williams and most professionals has been all-the-more mind-blowing after this project. But I found it hopeful that simply reading The Comedy Bible and doing just the first six days of exercises actually made me funnier, lighter on my verbal “feet” in everyday exchanges. It was like I’d discovered some secret hand-shake and was now able to use it, um, secretly. Maybe not the best metaphor. In any case, engaging in a “practice of funniness,” actually had measurable benefits. The question now is, can I keep it up? The comedian it seems, sacrifices some shred of health and life for those who laugh at her. That seems utterly clear for Robin Williams. His powerful humor apparently came with powerful pain. In my own experience, the comedic practice I tried out, with its soul-searching light-footed honesty, stream-of-conscious journaling and intimate accountability felt more like an antidote to my psychic ghosts, than a self-denying escapism. So maybe if I keep up the funny practice, I’ll be laughing more into old age than my father has. And maybe I’ll even be around when my kids finally shake the yoke of their germanic heritage and become even funnier than their old man. This entry was posted in Muse and News and tagged comedy, humor, Playback Theatre on August 16, 2014 by chris.